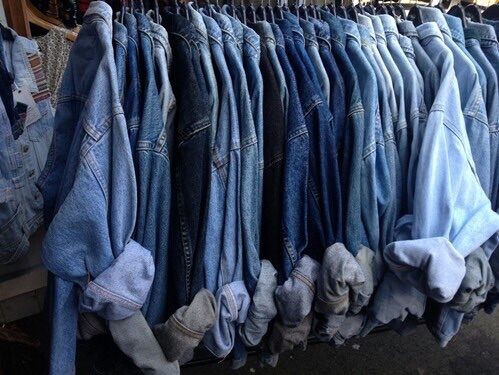 Confessions of a Denim Addict. And this one is serious. This obsession shows no sign of slowing down. I purchased my fourth denim dress last week. One of my friends actually caught me leaving Topshop and when I refused to let her see the contents of my bag she grabbed it off me and revealed the shame of my latest denim purchase to the streets of Nottingham. I told her it was for my sister and shoved it back in back before escaping red faced and out of breath from the sheer embarrassment of the revelation of my addiction. In some ways my addiction has benefited me. I am a connoisseur of denim. If a friend wants advice on a certain brand of jeans and how they fit, they come to me. I am an oracle of denim knowledge. You've got to cut me a bit of slack though, part of the reason behind my excessive collection is the fact that half of my jeans simply can no longer be contorted and squeezed onto my seemingly ever expanding thighs and yet I refuse to dispose of them in the futile hope that one day they may be worn again. But that is just an excuse. I genuinely have no idea how many pairs of jeans I actually own (disclaimer: another pair are currently on their way to me in the post) I have three pairs of dungarees and two pinafores, three jackets, and at least four shirts and that's not even mentioning my dresses. I actually discovered on a visit home the other week one of my childhood toys; a denim teddy bear. Yeah, I didn't know such a thing existed either, but surely this highlights that I am not to blame for my problem. My mother should have never given such an easily influenced child a toy made from such a gateway material. Sorry mum, but maybe this ones on you.